Ruby Rose Road Show Calendar! I need to share this with you because I have LOVED listening to it! Oprah Winfrey’s new book WHAT I KNOW FOR SURE!! Whenever I am getting ready to head out on the road, my biggest treat (after grocery shopping) is to go to Audible.com and choose a book or two to listen to while en route to my next Ruby Rose Road Show. My latest choice was Oprah’s book What I Know For Sure. OMG, I am actually on my 3rd Listen! Oprah Winfrey has the most pleasant voice ever and she has this special gift of making you feel like she is talking directly to you! I find myself having a conversation with her! We chat not only while I am driving, we chat on my morning walk, while I am working in the yard, when I am riding Janey (my horse), when I am cleaning stalls, when I am steaming all the new RRCC Fall Fashions. Oprah goes with me just about everywhere! So, I highly recommend reading or listening to this wonderful book . Check it out at the following. oprahwinfreywhatiknowforsure.com/ And if you haven’t tried out audio books, I also highly recommend www.audible.com! 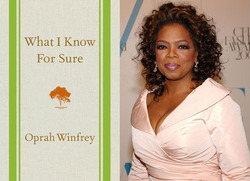 “What I Know For Sure” is that you will love Oprah Winfrey’s latest book!! ← One Year Has Gone by Sooooooooooooo Fast! One Year Has Gone by Sooooooooooooo Fast!